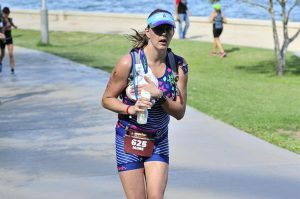 An Arizona military mom pumped breastmilk while running in a 70-mile triathlon, and smashed her personal best time while doing it. Amazingly, she simultaneously pumped her 7-month-old son a bottle of fresh milk and beat her previous best time by almost half an hour. Sloan had previously completed several Ironman races — 140.6 and 70.3-mile triathlons — around the world. Given her issues with low milk supply, she knew it was important not to go half a day without pumping. “I was thinking I might even be able to make it through the whole race without pumping,” Sloan told the New York Post. After suffering from sciatica during her pregnancy, Sloan was determined to get back to training six weeks after her son was born. Sloan started running, cycling and swimming shortly after her now 2-year-old daughter was born too, realizing the endorphins helped with her postpartum anxiety. The 34-year-old says it was also important for her to show that women who have recently given birth that motherhood doesn’t mean they have to give up their other dreams.